Record Breakers is another BBC childrens TV show like Blue Peter, that tries to be a little more intelligent than most children’s shows, and that ran for years and years (although it fell far short of Blue Peter). Â It started airing in 1972, and came to a close in 2001, so it was on our screens for nearly 30 years! The name that is most associated with Record Breakers is Roy Castle, who was the host of the show from the beginning until 1994 when he sadly died of lung cancer, which as a non smoker he attributed to years of playing the trumpet in smokey jazz clubs. Â Roy was a variety artist through and through and was an accomplished trumpet player and tap dancer, though he could turn his hand to just about anything entertainment related. The show was co-hosted by twins Norris McWhirter and Ross McWhirter. Â I must say I never remembered Ross, he was a bit before my time, but I certainly remember Norris. Â Both brothers were editors of The Guinness Book of Records for many years, and both had photographic memories. Â There was a segment on the show where kids could ask the brothers questions about world records, and they could always answer them! Â I remember one time a boy in the audience called Norris out on a question about the biggest diamond (I think). Â Turns out the little upstart was wrong and Norris was correct! Norris and Ross are both sadly no longer with us, but it is amazing how they found the time to do so many things with their lives. Â As well as editing the Guinnes Book of Records they were atheletes, sports journalists, political activisits, and of course TV presenters! Â Norris died aged 78 after a heart attack whilst Ross was shot in 1975, aged 50, by two members of the IRA, after Ross put up a reward for information about several bombings that had occured. Anyway, back to Record Breakers itself, which if you haven’t guessed by now was a celebration of any kind of world record. Â Each show would tell you all about a particular record, who held it, what they had to do and so on. 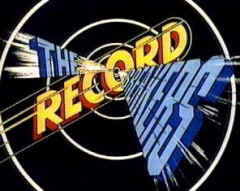 Â Quite often there would even be a record breaking attempt on the show itself, which was always very exciting to watch. Â Roy himself set several records himself on the show, including that of fastest tap dancer, most people tap dancing at one time and rather more strangely, playing the same tune on 43 different musical instruments in just 4 minutes. 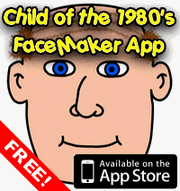 During the 1980’s Roy was assisted in his presenting duties by first Fiona Kennedy, who I personally found a little boring, she seemed to serious, and then Cheryl Baker of Bucks Fizz fame, who was perhaps a little too madcap at times, but was preferable to Kennedy! Â Other presenters were the annoying Kriss Akabusi (why does he have to laugh so much) and fellow athlete Linford Christie, and apparently Fearne Cotton has had a stab at presenting it too. For a few years there was also a segment about American record attempts that was presented by Ronald Reagan Jr. Yep, that’s right, the son of former US president and actor Ronald Reagan. Like many memorable kids shows Record Breakers was also gifted with some memorable theme music. Â Both the opening and closing theme were sung by Roy Castle (aided by other presenters as they came and went) with the closing theme in particular being very memorable. Â This was the song “Dedication” which Roy sang and played on the trumpet at the end of every show. Â Surely everyone must remember the lyrics! Dedication. Â Dedication. Â Dedication. and you wanna beat the rest. Oo-ooh! Â Dedications what you need. If you wanna be a record breaker. Â Record Breaker ooooooh! Great stuff, but Roy did it far better than I ever could. Â Wish I could have found a video clip of him singing this song, but there seems to be a distinct lack of footage on the Interwebby. Â Instead, here’s Roy breaking a parasailing record flying under bridges on the Thames! UPDATE! There’s been some discussion in the comments about the “most number of people tap dancing at a time” record that was organised by the programme. Several of you took part in this, and I can now add an image of the record taking place courtesy of Joanne. Thanks Joanne! You can click on the image to view it at full size. This entry is filed under TV - Kids, TV - Teens	and was posted on March 5th, 2009. You can follow any responses to this entry through the RSS 2.0 feed. You can leave a response, or trackback from your own site. Anyone know where to view a copy of the most tap dancers with Roy castle. It is not the one at tv centre, it was after that around 1980??? Filmed on the sea front in Portsmouth I believe. Remember it was in the formation of the words record breakers and filmed in a helicopter. Remember it being cold and windy!!! I too was involved in this, I have told friends for many years about the experience, my dancing school made up part of the D in record and we were next to the helicopter going up and down! Was freezing but good fun! I was also there! My dance school was in the ‘A’ of breakers, I remember waiting round for ages drinking hot chocolate. 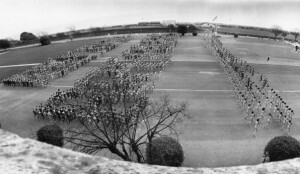 Portsmouth airfield, it was held. Windy…rainy…. Cold, haha, turquoise catsuit. Those were the days. Would love to show my daughter some footage but can’t find any at all. i too remember that cold windy day dancing in the lettter D great memmories , makes me smile to see other comments from the girls back at sholen . I was there too & have been trying to find a clip. I was in purple, in one of the underlines & broke away from the rest of my group so was a little purple dot on my own! I remember being freezing & then Roy Castle flying in at last minute & saying to my friend ‘you look nice & warm’!! I was there too I can’t remember what colour we wore? Pink? Has anyone found any footage! I remember it being freezing cold. Would love to see some photos at least. Brilliant hearing about all those who were at Portsmouth – I, along with my dance school was at the top of the B – it was freezing and the helicopter just added to that! One of our girls passed out with cold! If anyone finds footage let me know!! I was there too from my dance school in Epsom. I was in Blue in the Letter R of Record. I would love to see photos or a video. I have a photo but no footage, any ideas how to post it so everyone can see it? If you’d like to and are able to perhaps scan it and e-mail it to me I’d be more than happy to add it to this article. There have been a lot of people on here who took part in the event and I’m sure they would all love to see your photo. did anyone ever find a clip? I was there too, front row of the O if I remember rightly. Don’t I’ve ever been soooo cold. Thanks for sending me the picture of the tap dancing world record Joanne, I’ve added it to the bottom of the original post. I too have looked for footage of this. I was also in it. Has anyone had any luck finding any footage?? I too took part in the record of the most tap dancers tap dancing at the same time in Portsmouth. We travelled from Old Corringham in Essex. We were so cold while waiting around a lot. We were wearing a red all in one with silver look tap shoes. We too had bowler hats but in red coloure. Jo Hoare – I’m sure it was filmed in November 1981 and screened on 27th December 1981. So was the portsmouth airfield the record breaker of the most tap dancers?I was there too with my dance school and was in a burgandy all in one,i too remember it was freezing that day,an the helicopter added to the strong wind!We had practised the routine over and over at our dance school and were al excited about being part of it!can someone tell me the exact date it took place please? Hi all, I was there front row freeeeeeezing in purple catsuit and plastic bowler. I remember it was a long wait for the “main” man and someone went down with hyperthermia ???? That was gorleston on sea ???? That was a great auto-correct. Goriest on Sea. Love it! Fantastic memories of tap dancing in Portsmouth.I also remember the cold and learning to love hot chocolate as it was the only thing to keep us warm. Travelled from Norwich and was in the line underneath Loved watching it on the tv at Christmas. Loved it so much now starting adult tap many years later. Would love to see it again. I was part of this tap dancing record too. I was dancing in the last ‘r’ in breakers. Does anyone know if the record is any of the record books ? And if so, which one? Has anyone found the TV clip.? Also travelled from Norwich and remember being frozen in the underline!! I don’t even remember the year, someone here said 1980, in which case I was only 7 or 8. I do remember making a friend on the coach who passed me notes, the words of which I still remember today ?. I too was there. In the top row on the R in blue as I was a Laines girl. I might write to the BBC and see if they can drag it out of their archives.